Emergency braking systems are among the most effective assistance systems in the car. In Germany alone, up to 72 percent of all rear-end collisions resulting in personal injury could be avoided if all vehicles were equipped with them. 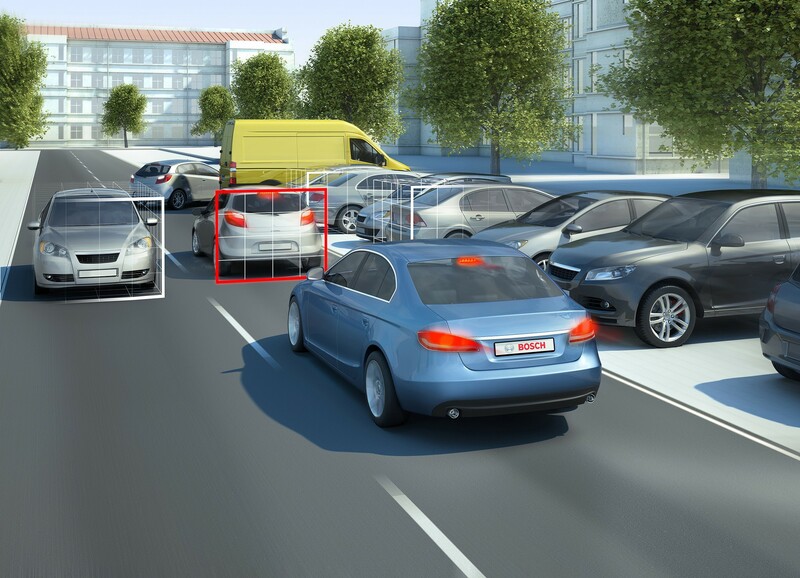 Now Bosch has developed a stereo video camera with which an emergency braking system can function based solely on camera data. Normally, this would require a radar sensor or a combination of radar and video sensors. “The Bosch stereo video camera is a single-sensor solution that makes various assistance functions affordable for all vehicle classes,” says Dr. Dirk Hoheisel, who sits on the Bosch board of management. Land Rover offers the stereo video camera together with the Bosch emergency braking system as standard in its new Discovery Sport. This system was developed in intensive and close collaboration between Bosch and Land Rover. When the camera recognizes another vehicle ahead in the lane as an obstruction, the emergency braking system prepares for action. If the driver does not react, then the system initiates maximum braking. The Discovery Sport proved how effective the function is in a Euro NCAP test: it was rated as “good” in the AEB city and AEB interurban categories. Overall, the Discovery Sport passed the test with five stars and achieved one of the best results in the “safety assist” category for 2014. To earn a top score from Euro NCAP in 2016 and beyond, cars must be equipped with predictive pedestrian protection. This can also be based on the stereo video camera. The Discovery Sport has also been awarded the What Car? Car of the Year Safety Award 2015 in the U.K.
braking system as standard in its new Discovery Sport. 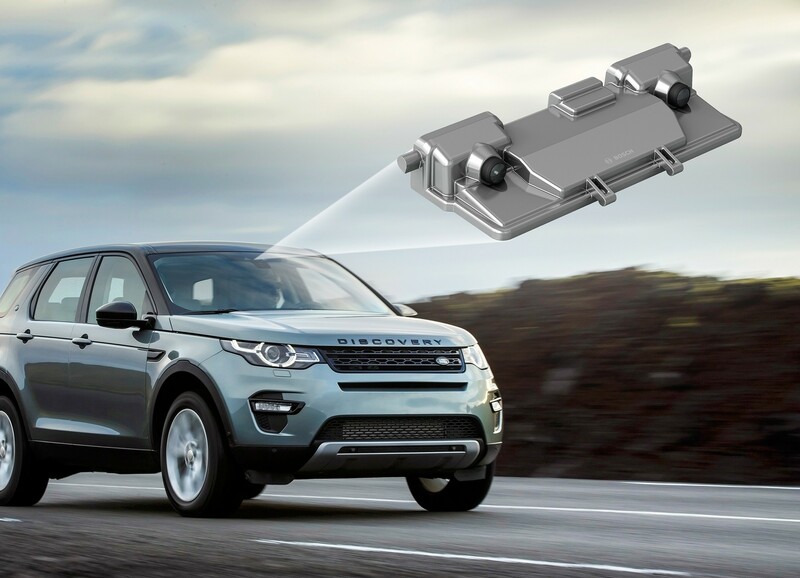 Important building block for automated driving Besides the emergency braking system, the new Land Rover Discovery Sport offers other driver assistance functions, some of which are also based on the Bosch stereo video camera. One such function is road-sign recognition, which keeps the driver informed about the current speed limit. Another is a lane-departure warning system. This vibrates the steering wheel of the Discovery Sport to warn drivers before they unintentionally drift out of lane. The Bosch stereo video camera sets new technical standards. With its light-sensitive lenses and video sensors, the camera covers a 50-degree horizontal field of vision and can take measurements in 3D at a distance of over 50 meters. Thanks to these spatial measurements, the video signal alone provides enough data to calculate, for example, the distance to vehicles ahead. “The Bosch stereo video camera and its 3D imaging capability are also an important building block for automated driving,” says Hoheisel. Its pair of highly sensitive video sensors are equipped with colour recognition and CMOS (complementary metal oxide semiconductor) technology. They have a resolution of 1,280 by 960 pixels and can also process high-contrast images. The camera’s high-performance computer makes it possible to integrate other measuring programs and functions and respond flexibly to market requirements. 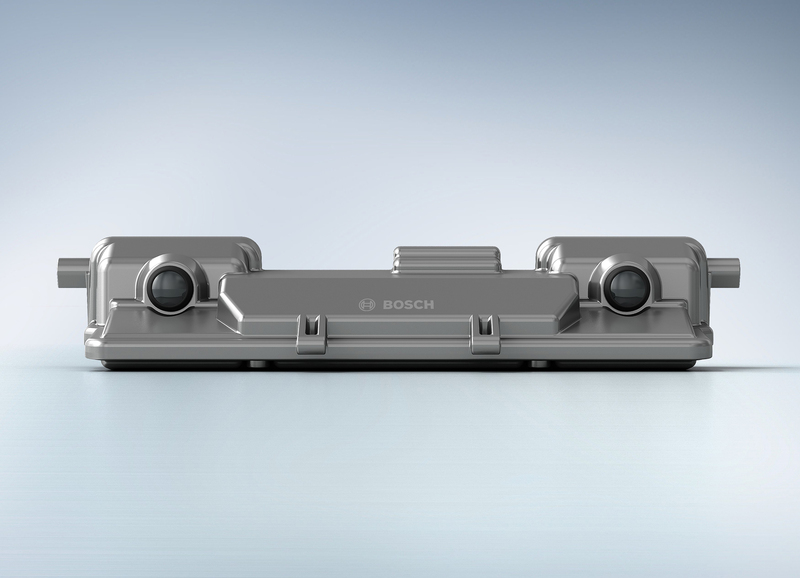 Bosch developed the entire stereo video camera in house from start to finish and it sets new technical standards. The distance between the optical axes of the lenses is just twelve centimetres, making this the smallest system of its kind currently available in the field of automotive applications. Thanks to the spatial measurements, the video signal alone provides enough data to calculate, for example, the distance to vehicles ahead. The smallest stereo video camera currently on the market One of the biggest advantages offered by the Bosch stereo video camera is its compact design. The distance between the optical axes of the lenses is just twelve centimetres, making this the smallest system of its kind currently available in the field of automotive applications. What’s more, the Bosch developers have integrated the control unit for image processing and function control directly into the camera housing. That means vehicle manufacturers can integrate the camera into the rear view mirror especially easily, impeding the field of vision only slightly. When the camera recognizes another vehicle ahead in the lane as an obstruction, the emergency braking system prepares for action. If the driver does not react, then the system initiates maximum braking. “We’re pleased to say that Bosch developed the entire stereo video camera in house from start to finish,” says Hoheisel. As a result, all components, from hardware to image processing to the functions, are designed to work together seamlessly. The Bosch camera also meets the stringent ASIL B safety requirement according to ISO 26262, which is relevant for safety-related emergency braking. In addition, automotive manufacturers can flexibly adapt the range of camera functions as they choose.